What About Weapons? – How do I protect myself? A cartoon-illustrated book on learning and teaching self-defense skills and strategies for teens and adults. Weapons increase the danger of an attack, and we can still protect ourselves most of the time. 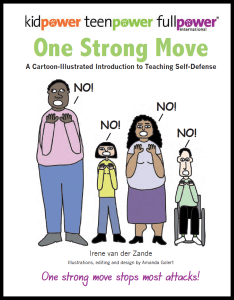 The following article is from One Strong Move: A cartoon-illustrated introduction to self-defenseand The Kidpower Book for Caring Adults, a comprehensive guide about personal safety, self-protection, confidence, and advocacy for young people. The mystique in our culture about the power of knives and guns can leave people feeling helpless at even the thought of a weapon. Sadly, stories like that of two teen girls who were kidnapped and sexually assaulted near their school by a man who told them he had a gun, even though they never saw it, are all too common. Unfortunately, the opposite problem is also common. In one incident, young people who knew each other got into an argument that led to a fight and a stabbing. In another, a teen boy got shot fighting over Halloween candy by a friend who had stolen his father’s gun. Both young people and adults end up injured, in jail, and dead because they don’t know how to walk away from an insult or how to give up their stuff. The biggest danger is believing the myth that there is no hope. For young people who live in areas with high rates of gun violence, the sense of hopelessness can be even bigger, and they need and deserve additional support for their physical and emotional safety. However, all young people deserve ‘the basics’ about safety with weapons. Here is what we teach students in our introductory self-defense workshops. Too many people have been injured or have died fighting over their property, so imagine giving up your stuff. Property can be replaced – you can’t! However, suppose an attacker tries to do something that would make things more dangerous for you, like take you away, tie you up, or hurt you. Allowing this to happen gives the attacker more privacy and more control, which is like giving more oxygen and fuel to a fire. In this kind of situation you are almost always safer if you yell and fight the best you know how in order to get away and run to safety as soon as possible. Most of the time, the attacker is not going to use the weapon. What if the attacker has a gun? One teen girl was walking home from school and a man pulled up in a car. He pointed a gun at her and told her to get in the car. Instead, she yelled and ran away, and she was safe. Law enforcement officials have told us that going away with an attacker is almost always much more dangerous than risking getting shot or stabbed to escape as soon as possible. What you see on TV shows and in the movies, where somebody shoots and everybody drops down dead, is fake. Even though you see stories about this in the news, this almost never happens in real life. Most of the time, even trained police officers, even at close range, miss a target moving away from them. So you are safest if you run away if you have any opportunity at all. Even if you do get shot, most gunshot wounds are not fatal and heal completely. We coach our students to turn and run away, in a curve or zigzag, if possible, to make it harder for the person with the gun to aim. If you don’t have room to run away at first, try to notice where the muzzle – the open, circular, discharging end of a gun – is pointing. As soon as the hole at the end of the gun is not pointing at you, do your best to pull away and run. Our self-defense book One Strong Move shows how to trick someone who is about to harm you by pretending to give up, distracting, lying, or asking questions. Be open to the wonderful plan that your mind can create. One man who was being kidnapped got away by hitting the hand the person holding the gun with his cell phone as he ducked out of the way, which knocked the gun out of the attacker’s hand so he could escape. Again, if the goal is robbery, we strongly recommend that you give up your stuff. But if the goal is to harm you or someone you love, be prepared to do everything in your power to get away and get help. What is an attacker has a knife? The self-defense principles with knives are similar to guns, with one important difference. If there is a knife and you have any room at all, your safest choice is to run away. However, you can also throw anything! You would not want to throw something at someone holding a gun, because it might go off by accident. With someone holding a knife, you can throw your backpack, a book, sand, or anything else around you to startle the person with the knife and to keep the knife away from you. Sometimes we have students practice throwing a pillow or grabbing some air and throwing it at an instructor who is pretending to threaten them with a knife. As they throw, they yell, “NO!” and then run to safety yelling for help. With this practice, students can see that when people believe something has been thrown at them, it’s natural to catch it or to block it and protect the face. The attacker is likely to focus on the thing that has been thrown, giving the person being attacked more time to run away and get help. “But what if there’s no room? What if the knife is right next to your body?” our students sometimes ask. If there’s no room, then you might not be able to choose whether you get cut, but you can almost always choose where you get cut. Better your hands or outer arms than your face, throat or mid-section. With older youth who are already worried about this, or with teens, we sometimes practice by coaching students to, “Imagine that someone is about to stab you with a knife. Put your arms up in front of you. Use the outside, bony part of your arms to block the knife so that it does not reach your face or your body. Yell ‘NO!’ and run to safety.” We also show how to use something nearby to block the knife, like a chair or a sweatshirt. Weapons in the hands of a child or a teen are extremely dangerous. From the time they were small, many young people have seen repeated media images of people being killed with no consequences. It can seem like a game, and they may have no real idea of what it means to shoot or stab someone. Would it be safer to have my own weapon? Our instructors, Jamiko and Ryan, explained, “The problem with having a weapon is that you are more likely to use it, which means that somebody is likely to get hurt and to get into trouble with the law.” The two men demonstrated the problem by standing face to face with their hands shaped into “guns” that were pointing at each other. Everyone could see how dangerous a position this was if either of them were to decide to shoot. Next, Ryan and Jamiko acted out getting mad at each other and, instead of pulling out a gun, both of them running away in the opposite direction, so that no one would get shot. Finally, they showed how, if one of them were to pull out a gun, the other one could run quickly away. 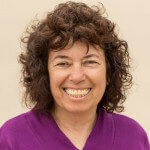 If you know someone who is joking or bragging about having or using guns or bombs or about hurting animals or people, this person might have big problems. Find out what resources your school, organization, workplace, and/or police department have for making an anonymous report and for assessing and addressing potential behaviors of concern. If you are worried about someone’s behavior and don’t have someone you trust to tell, know how to make an anonymous report to let people know about possible danger. In some situations, it may be necessary to make a telephone call anonymously to someone in charge, such as a school principal. You can disable caller ID or call from a pay telephone. Anonymous telephone calls or notes will only be taken seriously if there are as many specifics as possible included in the message. Make a plan about what to do if someone is threatening you with a weapon in your school, home, or car. It is less upsetting to imagine a plan that keeps you safe than to keep imagining disaster. Remember that if someone starts waving a gun or a knife or starts shooting, almost always the safest thing to do is to get away as quickly and quietly as you can. You will almost always be safer if you keep running away, even if the person with the gun tells you to stop. Have a safety plan for how to get out of a home, school, or car in case of danger – whether the safety problem comes from a fire or a person. Think of escape routes – out of different doors, climbing out of a window, going down the stairs, breaking glass with something hard like a chair and jumping out of a window. Remember that it is worth getting injured to get away from someone who is shooting. If a gun is shot, it will be loud, and you don’t want to be shocked into freezing. The great thing about adrenaline is that it can help you run fast, even if you are hurt or start to bleed. If you are hurt by a gun, you can get better most of the time, just like you get better most of the time when you fall down and get hurt and bloody. Finally, our instructor said very calmly, “Everybody, look at your arms and pretend that you are bleeding. Say, ‘I got shot. I am bleeding. I am going to get help.” As all of the children looked at their arms and repeated after our instructor, the boy visibly relaxed. Keep a sense of perspective. Remember that the media does not normally report all the times that a bullet hit a tree or fell harmlessly to the ground. Probably you will never get shot at. If you do, probably the bullet will miss. But suppose that you get shot in the arm. Will it hurt? Will you bleed? Will you need medical attention? Will you live? Almost certainly you will! No attack is over until you have gotten help. Once you get away from a dangerous person, as soon as you safely can, find an adult you trust to go to for help and notify authorities if at all possible. Safety with attacks with weapons is very much like safety with fire. It is unlikely that your school or house will burn down, but everyone is safer with a plan in case there is a fire. Facing an attacker with a weapon is also unlikely, but having a safety plan that addresses this issue helps keep everyone as safe as possible. Worried parent’s question: What if I’m on the playground and someone starts shooting at the kids?